Tuberculosis is a bacterial infection that primarily affects the lungs but has the potential to transfer to other organs in the body, if left untreated. Symptoms of tuberculosis include coughing up mucus and/or blood, fatigue, fever, excessive sweating, pain in the chest, and wheezing. 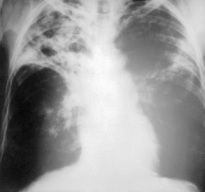 If tuberculosis is not treated in a timely manor it can result in permanent lung damage. Tuberculosis can be transmitted through the air. When an affected person coughs or sneezes they distribute an infectious spray of droplets from their saliva. Forty thousand droplets can be expelled from one sneeze. 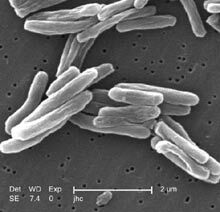 Mycobacterium tuberculosis is the bacteria that causes tuberculosis. This bacteria is actually a slow at multiplying, in comparison to other bacteria, conducting binary fission every sixteen to twenty hours. During the 1920's and 1930's thousands of people, in the United States, were infected with tuberculosis. Many of these people traveled to Tucson Arizona to assist in their recovery, due the area's dry climate. North of where the University of Arizona currently resides, land was used to build tents for those who were infected. Due to the large number of tuberculosis-infected travelers, many sanitariums were built. Some of these sanitariums still stand today but are now used as hospitals and clinics. 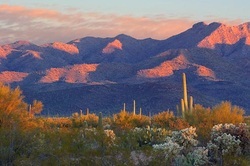 In the late 1930's my grandfather, Jerry, who had lived in Tucson the majority of his life, contracted the infection tuberculosis when he was twenty-five. His brother who was eighteen also became infected with tuberculosis. Jerry was admitted into a sanitarium along with his brother. While he was in the sanitarium his lung collapsed from the infection. Fortunately the doctors in the sanitarium were able to assist him and re-inflate his lung. My grandfather, Jerry remained in the sanitarium for a year and was able to fight off the infection. Unfortunately his brother became victim to the infection and passed away later that year.